← Managing San Jose scale to prevent fruit loss in 2016. A portion of the overwintering adult psylla population reside in the orchard where they remain in diapause until temperatures exceed 45F. The overwintering females will then seek out males and mate before fertile eggs can be deposited on branches during the spring. With temperatures now in the 60’s the adults become more active and have been observed flying about this afternoon in pear orchard from Orange to Columbia Counties. The first eggs, in moderate numbers of 50 per 71 buds (0.7 eggs per bud), have been observed in Marlboro, NY. These are the earliest deposits of eggs I have observed during my tenure at the HVRL. Considerations for management in southern blocks and orchards along the Hudson River should begin as weather permits. Cool temps and rain are expected throughout the week when temps move back into the mid to upper 50’s over the weekend. In the overwintering stage, the adult lingers about the orchard and woodland edge from fall, through the winter into spring. Adults are often seen in flight during the warm hours of the day, with increasing movement of woodland adults into the orchard over the next few weeks. After mating, females begin to produce the first of three to four generations beginning with egg laying and nymph hatch from late March through June. When scouting for early egg laying, focus on the terminal end of the fruiting branches using magnification along the basal plates of buds. The pear psylla, Cacopsylla pyricola, is a tenacious adversary, causing yearly economic loss to European pear varieties by way of fruit russet, pear decline and ‘Psylla Shock’, a toxic response to psylla feeding. 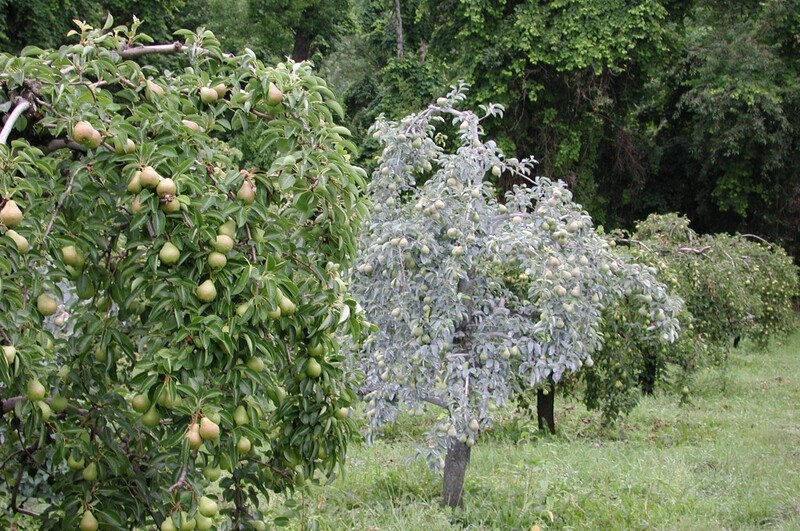 At high densities, pear psylla causes tree stunting, pre-mature leaf drop, reduced fruit size, and premature fruit drop, resulting in substantial losses in yield. Tree decline and often death of sensitive pear varieties such as Bosc can occur if left unmanaged. 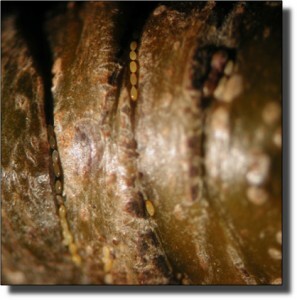 The deposit of ‘honeydew’ or the shunting of excess sugars from the psylla nymph onto the leaf and fruit, acts as the substrate for sooty mold development, causing leaf scorch and russetting of fruit at harvest. Nymph and adult movement throughout the canopy can increase the spread of Fabraea maculate spores, increasing infection that may increase fruit infection and early leaf drop. 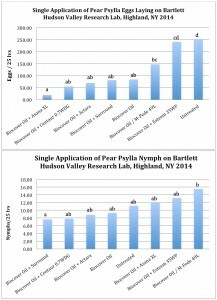 Strategies to manage pear psylla include pre-bloom applications of ovipositional deterrents, ovicides and insecticides aimed at the adult and nymph populations. Early management should begin upon the first signs of the egg. To delay the insect from laying eggs, Surround WP or oil, both acting as a barrier film, can be used. Either of these products will reduce egg laying by adult pear psylla. Delaying oviposition of the adults buys time for a greater number of over wintering psylla to enter the orchard from the hedgerows and woodland for a later adulticide application. In 2014 the results of the data from a single collection from this trial is shown below (click image to enlarge). We often think a single application of oil and a pyrethroid will ‘do the job’ during the pre-bloom period. The data suggests that although the egg numbers are lower then the other treatments, possibly due to repellency of the pyrethroid, prior egg hatch and nymph development had not been suppressed. The use of oil in combination with either Centaur, Actara, Surround or oil alone showed no significant difference in oviposition, albeit lower numerically, with the use of soap showing little in the way of nymph reduction. The economics in management is a driver in decision-making. Surround WP is most effective at the highest labeled rate of 50 lbs. / A (roughly $1.00 per pound) costing about $50.00 / A. Two to three applications during the pre-bloom and petal fall period have shown to be a viable approach to early psylla management. The use of a single prebloom application at 50 lb./A Surround was comparable to a single 2% application of Damoil in reducing oviposition when applied at the same time. Yet as the season progressed, the Surround treatment performed better in reducing the nymph presence on foliage during later assessments.. The stratification or layering of the kaolin clay, the active ingredient of Surround, builds on the limbs to maintain the product on the tree. Using early season applications through to petal fall have additional benefit of controlling plum curculio along with reducing egg laying from the 1st generation of psylla adults. Surround has not been shown to be toxic to the insect and as such, is an important tool for use in resistant management strategies for this insect. The 2012 Scaffolds article addressing early Surround WP followed by 1% oil strategy in can be found here (http://www.scaffolds.entomology.cornell.edu/2012/SCAFFOLDS%203-26-12.pdf). The advantages of using oil to control this insect are many. Oil is still a relatively inexpensive material for which there has been no mechanism for resistance development by the insect. It provides a degree of egg laying deterrence to treated buds and wood lasting a week or two depending on rates and weathering. Higher rates would be applied at the dormant stage this week, using one spray of 3% oil, or two of 2% to green cluster. This rate will also reduce overwintering populations of San Jose scale, European red mite, pear leaf blister mite, and Comstock mealybug. If you begin at swollen bud, one spray at 2% or two at 1% up to white bud would suffice. Contact of the adult by oil droplets will cause mortality while applications over top of the egg will reduce adhesion, often causing them to dislodge from the tree. Oil applied prior to oviposition acts to delay and synchronize egg laying later into the season, producing subsequent emergence of the nymphs for a concentrated management approach using a single insecticide application. Negative observable impact of oil applications has been shown to cause enlarged lentilcels on developing stems which may have impact of plant respiration. Ovicides can also be employed to kill the eggs prior to hatch. The use of Esteem and Centaur work as insect growth regulators (IGR’s) to inhibit development of various life stages. Esteem 35WP, used prebloom to kill the egg stage of psylla and reduce the viability of eggs laid by treated adult, should be applied prior to sustained egg laying with 0.25% v/v horticultural spray oil. Esteem may be applied once at delayed dormant to “pink stage” at 5 oz/A, or two applications at delayed dormant to “petal fall” stage at 4-5 oz/A, as a tactic for both psylla reductions and as a resistance management strategy. 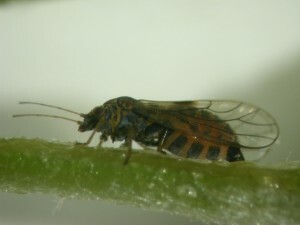 Remember, its mode of action is as an ovicide, so it will not reduce the adult or nymph population directly, most effectively used if the material is on the wood or foliage prior to the eggs being deposited. Using an ovipositional deterrent (oil, Surround WP) is a prerequisite to at least two follow-up strategies. One option, upon completed migration of the adults into pear orchards, the use of an adulticide is made to kill the adults, before significant eggs have been laid. Adulticides would be employed this season from mid to late April to significantly reduce the adult population. The choices for managing adult psylla include the neonicotinoids Actara 25WDG at 5.5 oz/A and Assail 30SG at 4.0–8.0 oz/A, and the pyrethroids (Ambush 25WP at 12.8–25.6 oz/A; Asana XL 0.66EC at 2.0–5.8 oz/100 gal; Pounce 25WP at 12.8–25.6 oz/A; Proaxis 0.5CS at 2.6–5.1 fl oz/A; or Warrior 1CS at 2.6–5.1 fl oz/A. The older insecticide Thionex is no longer labeled on pears. Multiple applications often need to be applied in order to achieve optimum early season control. Cool weather provides conditions to optimize the use of pyrethroids. However, the use of these insecticides over the past 20 years has decreased pear psylla susceptibility to the pyrethroids such as Asana (esfenvalerate) and Warrior (Lambda-cyhalothrin). Their use should be limited and used only during periods of cool temperatures.